Photographer: Mikael Schulz. Model(s): Miss Fame. 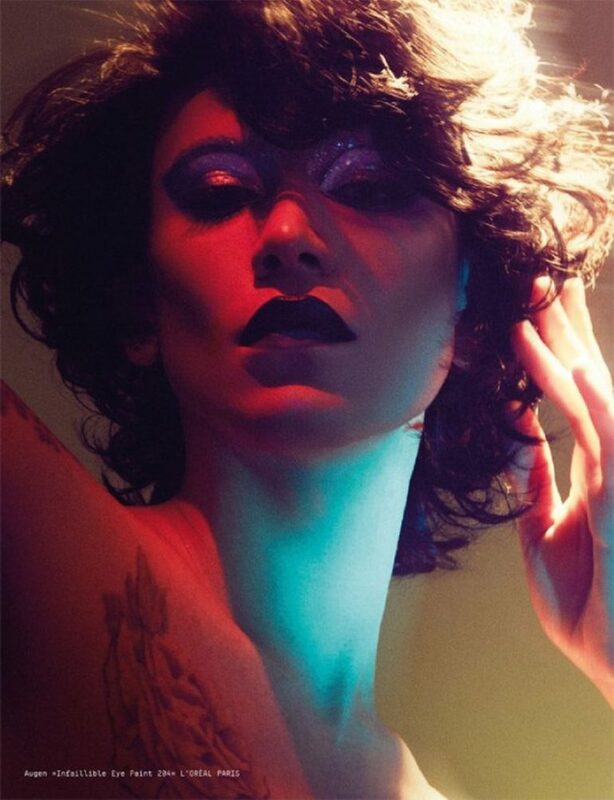 Source: Tush Magazine. Hair: Yukiko Tajima. Miss Fame plays a “Fame Fatale” by Mikael Schulz for TUSH Magazine #41, Winter 2017. This story moves with fire and grace… beyond gender and race… outside of time and space – this takes us to the beyond. The art of Extreme is lost in a dream as all things go hazy in the moments inbetween. A celebration of the skin. Makeup application is explored, showing a compilation of unique techniques. A cosmetic clash if you will. This installation implements many styles, as Schulz gives us a fusion of live art and avant-garde application. Expressionism has a new face as pretty is the palate and passion is the page. Makeup isn’t just drawn over the skin, rather, it’s beauty told through brilliant brush strokes. Her violet eyes mystify as neon lights ignite from behind. Live Art explodes, in an issue dedicated to the Diversity of People. Art and excess blend in both beauty and bliss, as we are invited to explore the outer reaches of the inner mind. “Extreme” is a projection of pretty that exceeds a dream. This sumptuous story does the unthinkable, as it allows us to see into another world, while connecting with our own. That’s really a remarkable accomplishment. Most of the time we experience visualization through the process of conceptualization. An intellectual exercise that allows us to blend our ideas. Then, when we’re truly moved to act, we engage in the process of construction. You’re able to fully observe while giving yourself the ability to transform. This may sound like a simple task, but what it can come down to is strength. All of us who live anywhere outside of the societal “norm” (as it’s called) knows what I mean. When adhering to your own inner voice comes in direct conflict with society at large, that can feel difficult. And, while that strict code has lifted, we still live under the “Rebel” brand. A name, I quite honestly, have worked hard for and have learned to love. So for the purposes of sanity, I’d like to re-brand us the “Artistic Rebels”. Yukiko Tajima works her wonder on these wigs by matching each one with pure precision. Red races over the locks leaving behind a fiery line, from icy blonde to a rich brunette the bold colors capture our imagination. It’s not just the light that shines from inside it’s human hope that arises in kind. A fusion of unstoppable forces come together to form something unique. Softness and strength combine, as this thrilling mix allows our minds to wander beyond our typical fair. A vision of vastness explodes as we journey into the unknown. 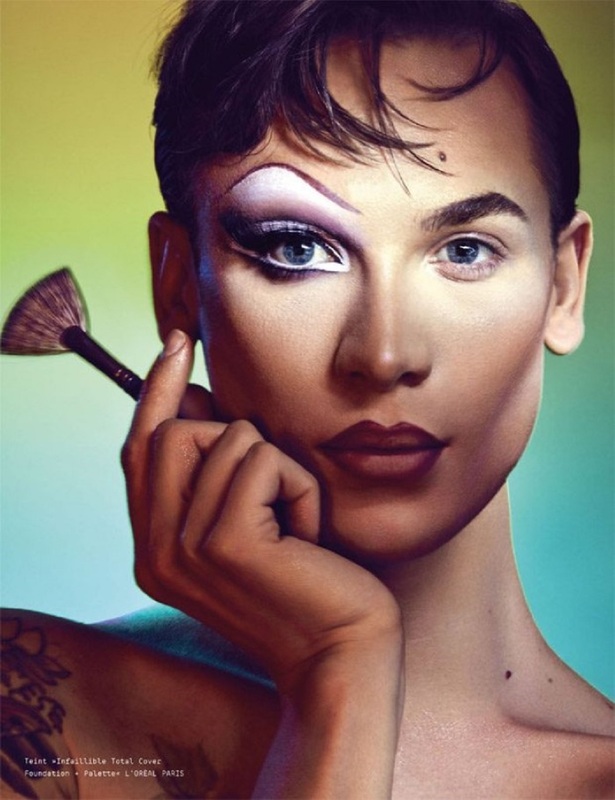 Miss Fame plays the game with stunning appeal, as even the most open minded among us need to push past the obvious and get to something real. Her violet eyes mystify as we fall into her scintillating stare. The Poetry of Pretty Presents… as longing looks linger on a sinful smirk will sing it’s song. Ombred lips light up the mouth from white to a deep, burgundy hue. Scarlet shadow burns up her lids as flames fire up her dew. Like airbrushing, the color is applied with the hand of a master. Her purple eyes open wide like wings preparing to take flight, as color floods over the brow bone creating a futuristic appeal. The mood shifts as the lights dim giving this image a sultry look. Disco days have arrived with eyes of white glitter that makes us feel alive. Drama drips over the page, as even the most open minded among us needs to push past the obvious and get to something real.